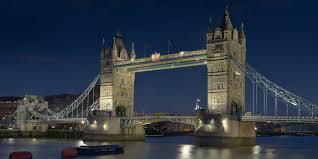 Tower Bridge is a bridge which crosses the River Thames close to the Tower of London. The construction started in 1886 and took eight years, so the Bridge was opened on 30 June 1894 by the Prince of Wales and his wife the princess of Wales. The bridge was designed by Horace Jones. It needed 70,000 tons of concrete and 11,000 tons of steel. It is a moveable bridge and it opens when a big ship drives through. It opens as far as it is required. The main street A100 leads over the bridge to the other side of the river. There is a reproduction in China.